You lost property on the train or at the station? Please call +43/6562/ 40 600 or send an E-Mail, we will be pleased to help you. Due to work on the tracks, all trains between Zell am See and Mittersill will be replaced by a bus service from Tuesday, 23.04.2019 (first scheduled departure of the day) through Tuesday, 14.05.2019 (last scheduled departure of the day). Buses will halt at bus stops on the No. 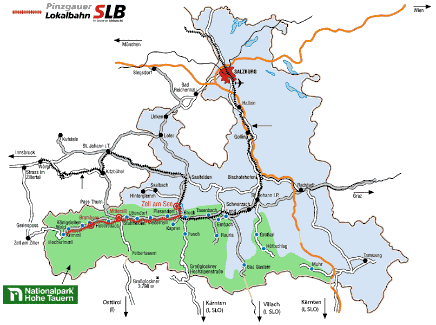 670 line closest to the railway stations, as well as at the railway stations in Zell am See and Mittersill. As a consequence, trains originating or terminating in Piesendorf, Piesendorf-Bad or Niedemsill will only halt at the nearest bus stop and NOT the actual train station itself! Bicycles cannot be transported by bus. Our railway employees as well as our ServiceCenter in Mittersill will be happy to provide you with additional information. We appreciate your understanding and wish you a pleasant trip! The local Pinzgau train has been around since 1898 and is not only a special attraction for narrow track railway fans. Enjoy a romantic trip through the wonderful Upper Pinzgau landscape on our nostalgia trains. (Mittersill 9.48, Krimml Waterfalls 10.35). From the end of May until the beginning of October: bike transport to the Krimml Waterfalls! If you have questions, suggestions or complaints please feel free to contact us via the contact form.